Superman to me has always been about a homesick lonely hero who decides to make earth home and tries in every possible way to live a normal life (as Clarke Kent) and do his bit to save the planet. The mental struggle to live in a society who labels Superman as an outcast and an alien plus Clarke’s daily struggle to fit in to human society knowing fully well that no matter how hard he tries to be as human as possible, at the end of the day, he is an alien. That is what Superman is all about. And I got a glimpse of that in Superman No. 2. The book opens with a very introspective Superman trying to figure out what the fire creature was that made an appearance in issue 1. As he tries to figure this out, he is interrupted by General Lane who is really pissed at the fact that Superman is a magnet to all kinds of evil scum in Metropolis and that he puts everyone (his daughter) in danger. I really like the panels on Page 7. The drama truly comes out here. Also, I would like to say that I am in love with Superman’s new boots. They are awesome. Superman, using his super-hearing is scouting for trouble over the skies of Metropolis and then comes across an invisible being whom he can just feel. The thing is beating up superman and both come crashing down to the streets. What is apparent by now is that only Supes is not able to see the creature, everyone else is able to see it. In the last panel on Page 10, there is a guy holding a phone with a pineapple sign at the back. Well played! 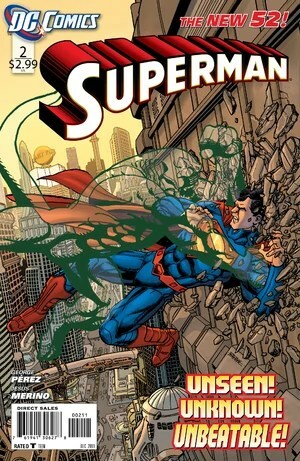 Some smart thinking by Superman and the creature is defeated. The Fortress of Solitude makes an appearance. That panel where Superman is sitting in his dimly lit fortress is somewhat the highlight of this issue. Atleast for me. It brings out what I said in the beginning. The artwork captured his loneliness in that one scene alone. The action sequences are drawn very well. Sharp and clean panels with proper expressions. All in all, a great issue. I enjoyed every bit of it. It is very well written. Such a drastic improvement over issue 1. 5 out of 5 for this. Just because I enjoyed every page.